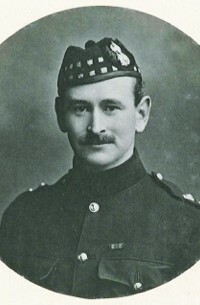 1901 Alfred Connell was gazetted to Royal Scots Fusiliers as Second Lieutenant on 5 January. In the census of 1901 he was stationed at Maryhill Barracks, Glasgow. Later that year he served in South Africa with his battalion and, as a result, was awarded the Queen’s South Africa Medal with four clasps (Cape Colony, Transvaal, 1901, 1902). 1903 Promoted Lieutenant 23 May. 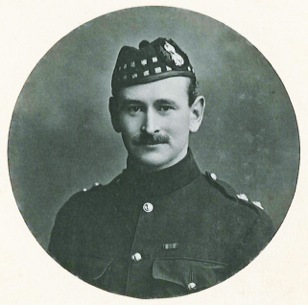 1911 Appointed adjutant of 3rd Battalion RSF,.stationed at Ayr, on 17 November. 1915, About 7 July he went to France. The original 2nd Battalion RSF had been virtually wiped out at the First Battle of Ypres in October 1914. It was reconstituted from drafts and Connell seems to have been in one of these. On 22 September Col Pollard o/c 2nd Battalion took command of 2nd Brigade and Alfred Connell took command of 2nd RSF. Between 25-27 September he commanded his battalion during the Battle of Loos. While going round his trenches to see to the men’s comfort after the battle Alfred Connell was killed by a shrapnel shell. His widow chose the phrase ‘Abide with me’ to be added to his gravestone. Husband of Nancy (sic) Connell, of Merville, Booterstown, Co. Dublin. 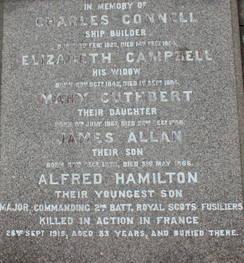 Son of the founder of Charles Connell & Co, Ltd, shipbuilders at Scotstoun. Much of the information on which this profile is based is drawn from various internet sources which are listed below. 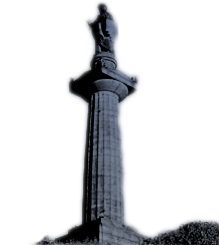 The Friends of Glasgow Necropolis also wish to make full acknowledgement and thanks for the permitted use of any information or images generously supplied specifically for exhibition, publication or display in connection with The Roll of Honour and accompanying profiles to Ancestry (www.ancestry.co.uk), Findmypast (www.findmypast.co.uk).